I’ve never read one of his books and probably won’t read this one not least because I’m still struggling with the image of a testicle let alone a shaved one. I think you’ve brought the image to life in a way even Chabon didn’t anticipate. We published our latest posts at exactly the same time this evening (afternoon). Karma or just a hint you should have a look at mine. I’m there right now. P.
I like the reading group posts. But you’d probably prefer me to elaborate there rather than here? And I’ll need a touch more time to make a useful or interesting comment as opposed to simply a comment. P.
Shaved testicle aside, it sounds like a novel that has tried too hard with too many characters. I tend to like just a few characters so the issues don’t get blurred. I haven’t read his books either – might just give one of his other titles a try and add it to my growing ‘to read’ list. Manageable if I spend less time blogging!! I liked “Wonder Boys” and I would recommend that to people who wanted to try Chabon. He did more by trying to do less, in my opinion. I read a sorta-interesting piece by Chabon on “Finnegan’s Wake” which came out during the summer, I think, and I wonder if Michael was over-influence by “Wake” and not in a good way. I don’t think I would spend my time reading a ‘pretty good novel’ especially not a long one. There are too many great books to read instead! Also, I find the review of such a novel a bit boring to read, perhaps because I’ve already lost interest in the novel itself. But generally I enjoy your reviews very much. I’m a big Chabon fan, so I don’t think you could have said anything to sway me from my desire to read this one, but this was a very astute and entertaining review nonetheless. I’m very much looking forward to hitting the testicle line and laughing to myself about your discussion here all over again. I realized a day after I posted this that, for a book I recommended people read, I had a whole lot more negative than positive to say about it. Chabon might be suffering from high expectations on my part. A great deal of the book is good and made me laugh. 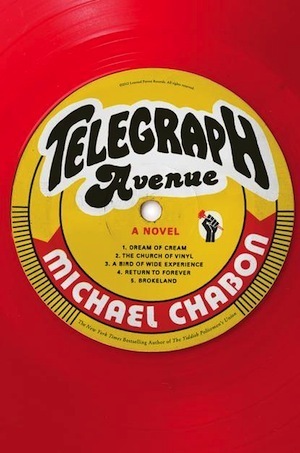 But Chabon doesn’t seem able to distinguish his A material from his B material in Telegraph Avenue. Chabon’s body of work is very hit-or-miss for me. I first encountered him through “Kavalier and Clay,” which I really enjoyed. I then back-tracked to “Mysteries of Pittsburgh” and was a bit disappointed, so I leaped ahead to “Yiddish Policeman’s Union” which I could not finish, no matter how many times I tried to force myself. I actually tend to like his shorter pieces, but I’m starting to think that it was just the subject matter that made “Kavalier” so interesting to me. I appreciate your review — the quirky lines you highlight here, which Chabon often fails to land, will probably be enough to keep me from picking up a copy anytime soon, although as soon as I find it for about $5 at a used store, I’ll likely give in. Did you like “Wonder Boys”? Because I did and always thought I should read “Mysteries” because I assumed the two were similar. I haven’t ever actually read “Wonder Boys”; I saw the move when it came out, largely because I had enjoyed Chris Hanson’s work on “L.A. Confidential” (one of my all-time favorite movies). To be honest, I hadn’t even heard of Chabon when the movie came out — I was still in college at the time and my reading tastes were still in expansion mode. Makes me think I should hunt down a copy and check it out, just in the interest of fairness. I avoided the movie version of “Mysteries,” partially because the book didn’t impress me and partially because none of the reviews I read had anything good to say about it. I thought the movie version of “Wonder Boys” did a good job capturing book, so I think you have a good chance of not being disappointed with the novel.